Well, I finally did it. 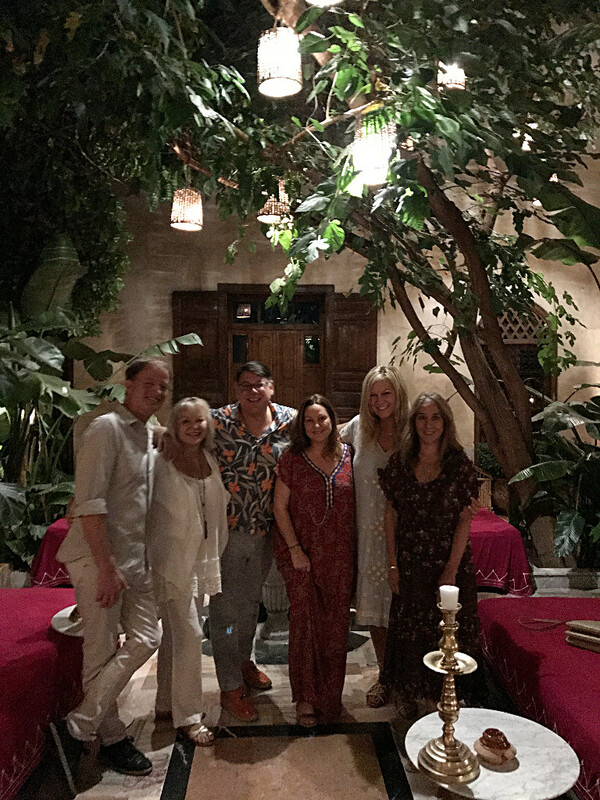 I took my dream trip to Morocco with a great group of friends. It was everything I hoped it would be and more, and all I can do now is dream about going back! 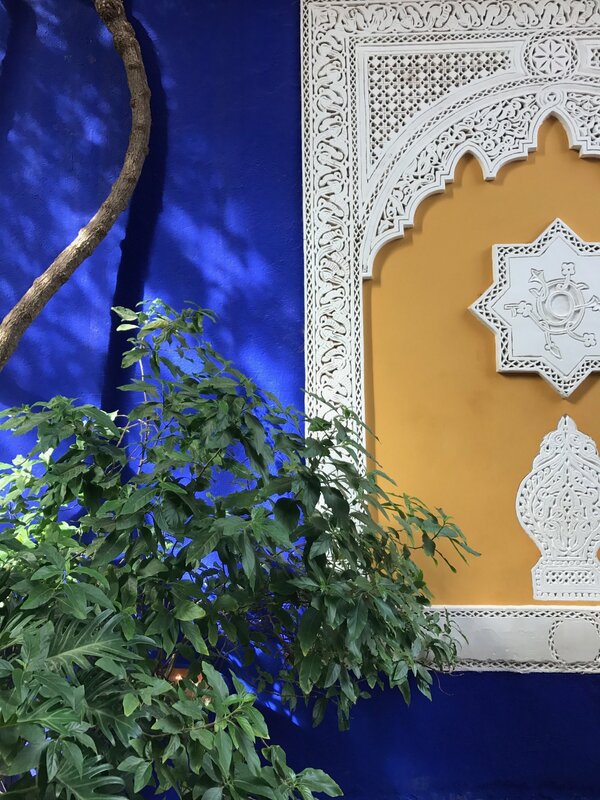 Marrakech was absolutely magical. The warmth of the people, the colors, the scents and sounds, it was all so overwhelming and wonderful. 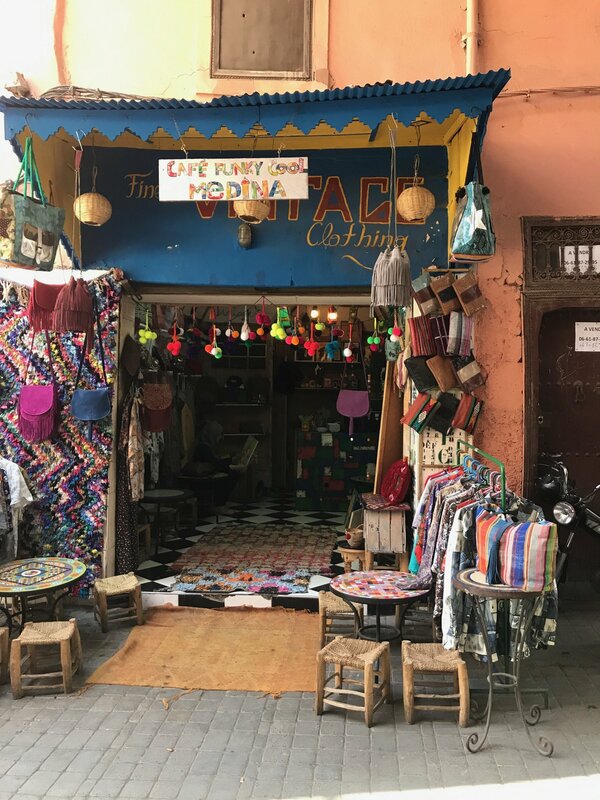 I hope this Gum Tree Guide to Marrakech inspires you to take a trip you’ve been dreaming of. I became obsessed with visiting Morocco probably 15 years ago. 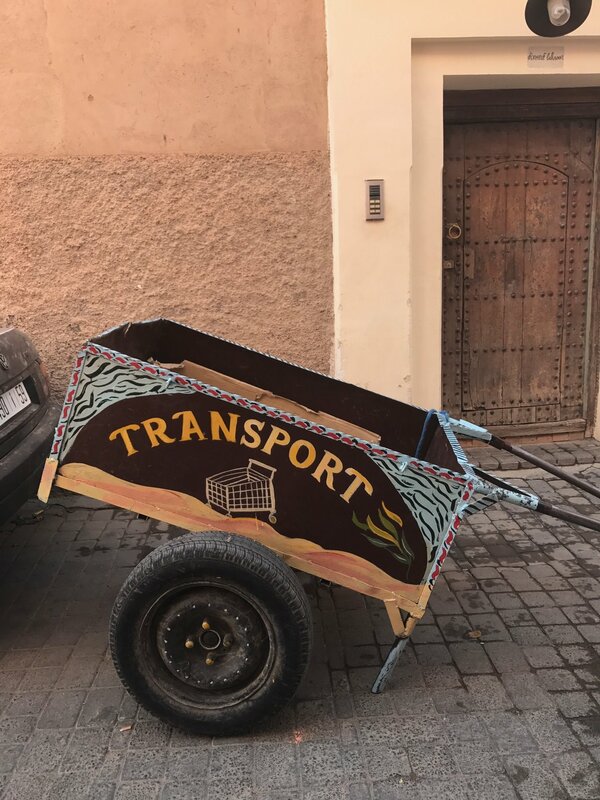 Then a couple of years ago I began following the beautiful Riad El Fenn on Instagram, and through that feed found others that brought the ancient city to life for me. I can honestly say that Instagram helped me plan my entire trip, where to eat and shop, what to look for, it’s a great tool in so many ways. 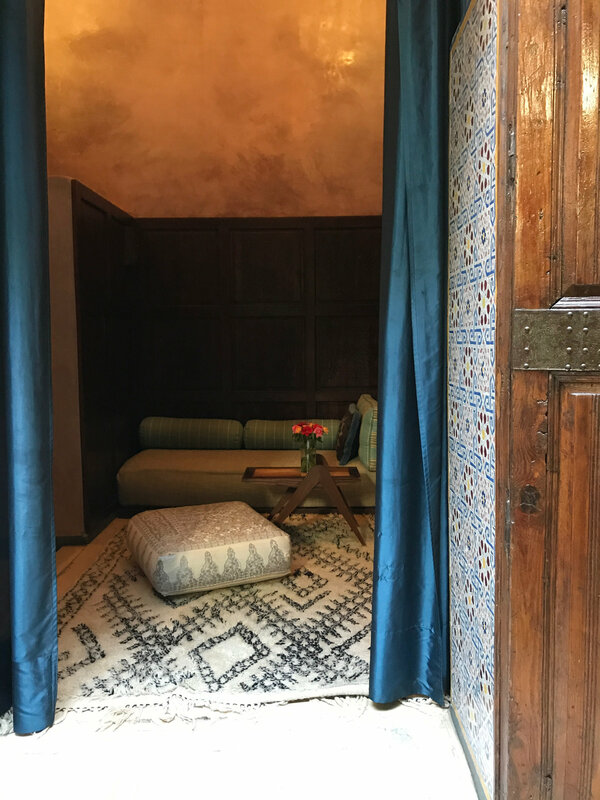 There are hundreds of Riads in the Medina (the old city) of Marrakech, but I knew I would stay at El Fenn on this trip. It’s a collection of many centuries old family homes gathered together over the years by Vanessa Branson, sister to Sir Richard, and her longtime friend Howell James. Everywhere you look you’ll find a beautiful scene. 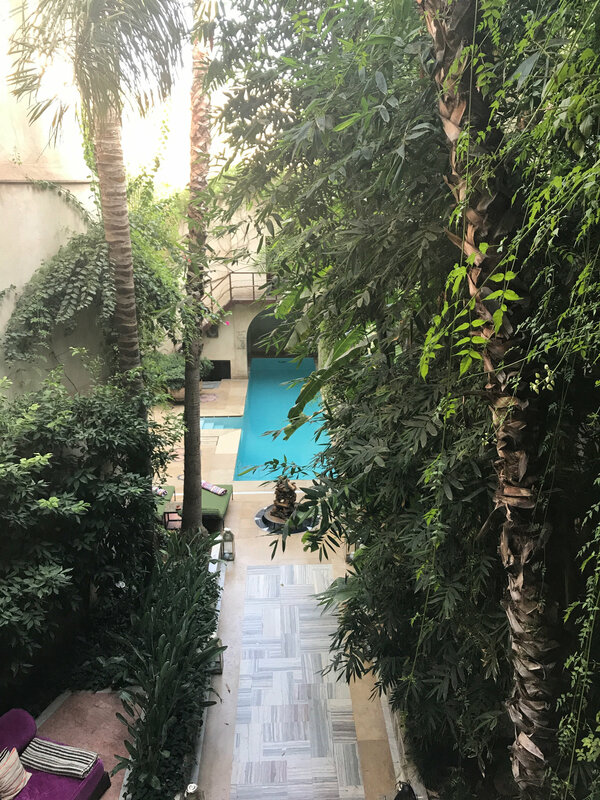 The color and light and sound of chirping birds envelope you, and the three pools provide welcome respite to the desert heat after a long day in the Souks. 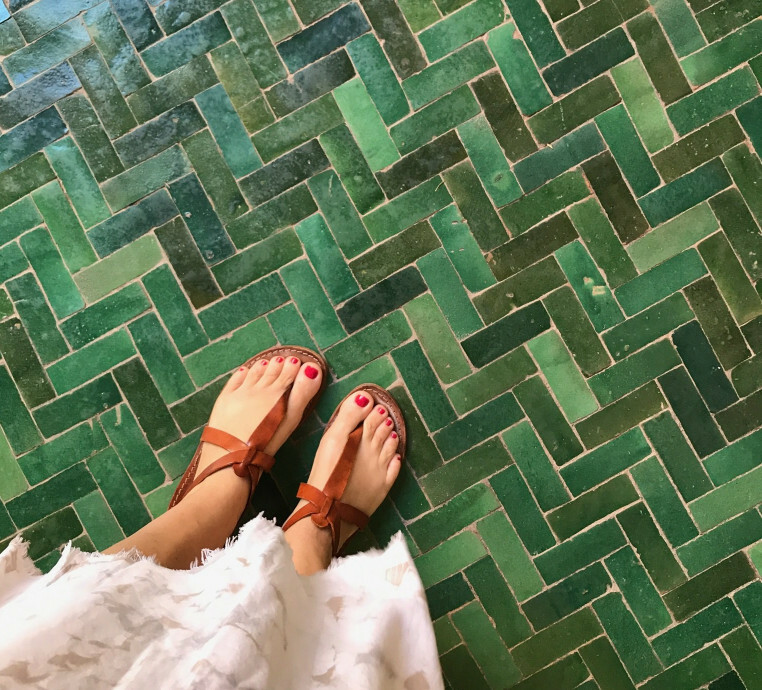 The floors of our room were patched camel leather, covered in the softest rugs, and lead outside the room to tiled corridors. 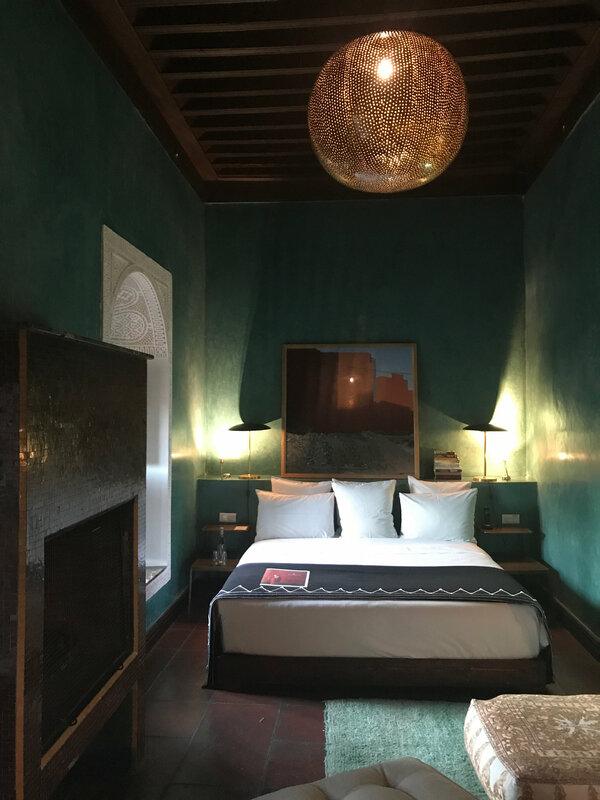 The walls were painted in rich hues using the tadelakt, or lime plaster technique, high ceilings, comfortable beds and beautiful artwork abound in each room. You’ll find a different color scheme in every room, with unique textiles, lighting and carved plaster details. A welcome bottle of wine greats you on your first day and a pot of coffee, and hot water for tea are left outside your room each morning. As beautiful as the rooms were, the staff was even lovelier. Bell was our go to guy in the reception area, helping us find a guide on the first day for a tour of the souks, booking our Hammam appointments, dinner reservations, calling taxis, even sending someone to collect us when we got lost in the Medina. Breakfast every morning on the beautiful rooftop was the perfect way to start the day. 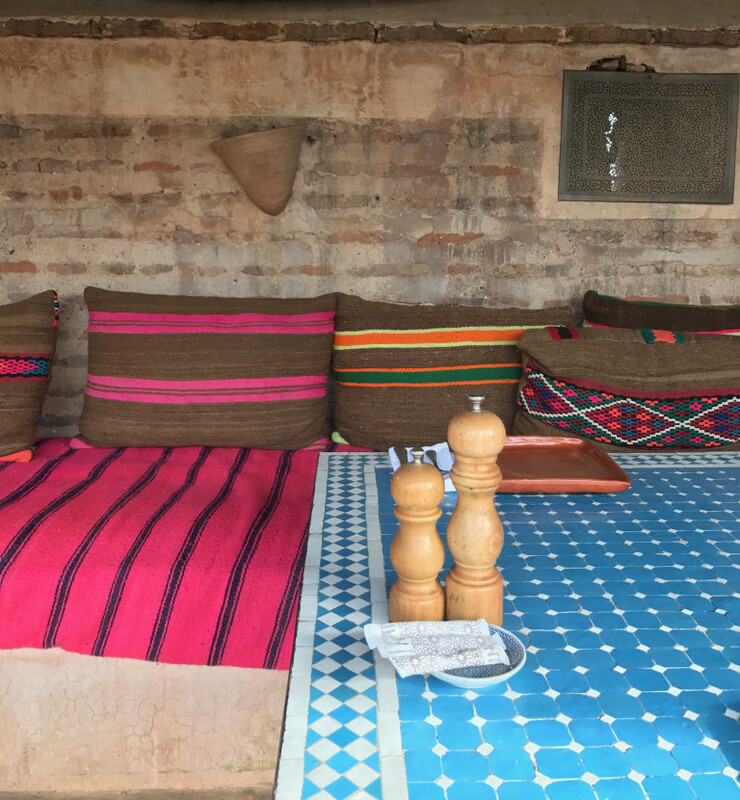 Homemade granola, fresh baked bread and croissants, and mint tea or strong coffee served on turquoise tiled tables, I could have stayed up on that rooftop all day everyday. We also had dinner up on the roof, and lunch, and each time the service and food were excellent. But I’d have a hard time ever skipping a stay at El Fenn. 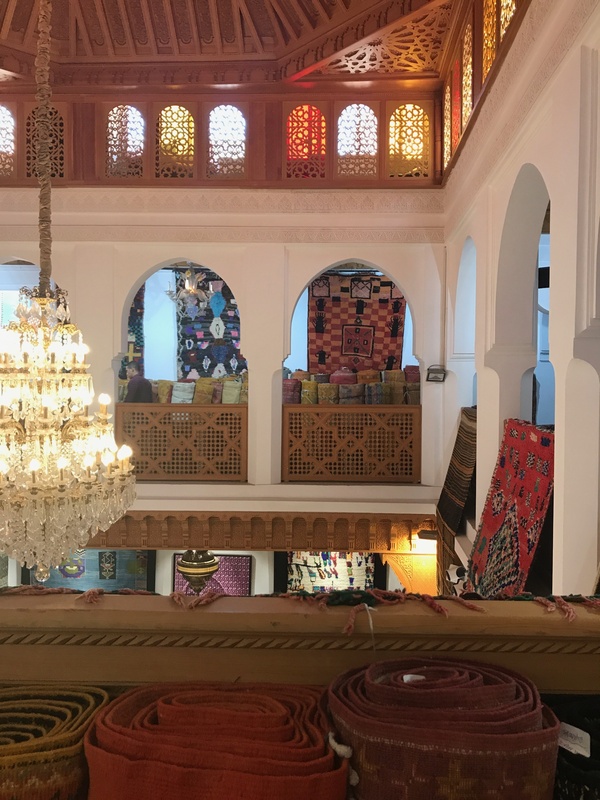 I could have spent weeks in the Souks exploring every aisle, touching every textile and haggling with the friendly merchants. This is what I came for and it did not disappoint. There’s so much color at every turn. 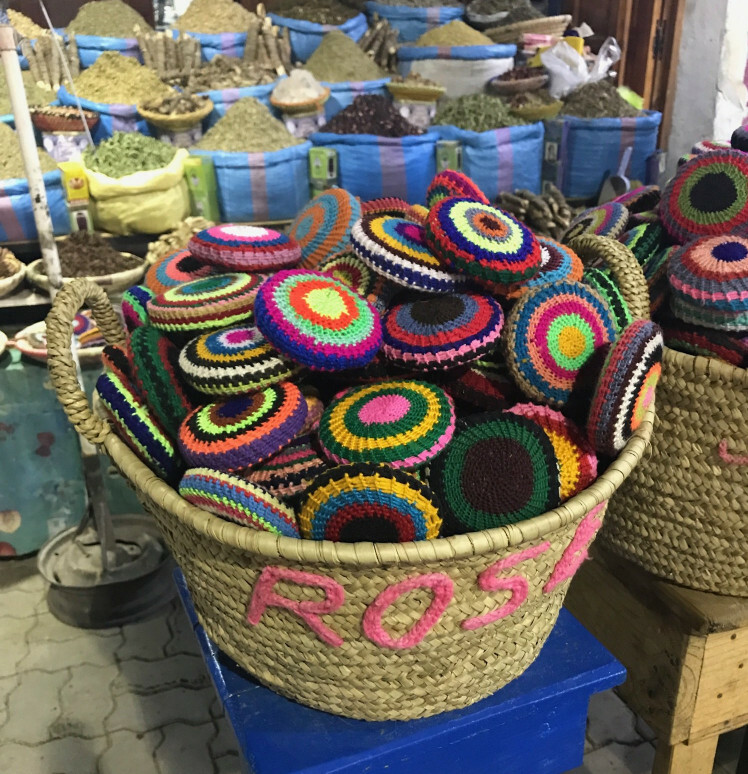 If you have time, I would recommend walking the souks for a day before deciding on anything, there’s just so much to see. You can fall in love with something different at every turn. That said, you may never find that shop you loved a second time, so if you’re totally in love with something, just buy it. My girlfriend BJ outside one of our favorite shops. Haggling is part of the culture, so be prepared to use your best bargaining skills. Some say that you should pay about a 1/3 of the original asking price, but I say that if you’re happy with a number just purchase it and move on. A couple of dollars might not mean much to you buy could make someone else’s day. In negotiating a fair price, as in life, I believe being nice goes a long way. There’s no need to turn into the ugly tourist, a smile and politeness will almost always get you your desired result. 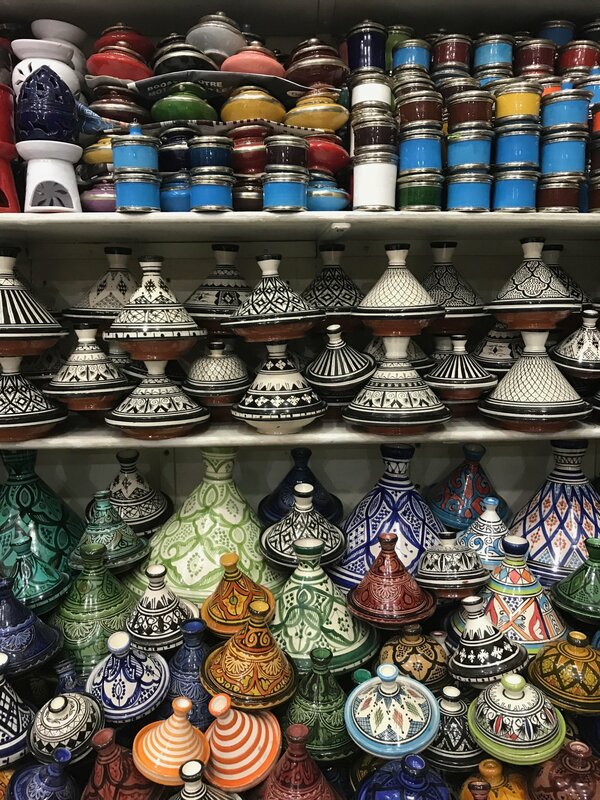 As much as I loved all of the pottery, I knew I did not want to deal with the complication of shipping it back home, so I stuck with soft goods that could be wrapped up easily and wouldn’t break. 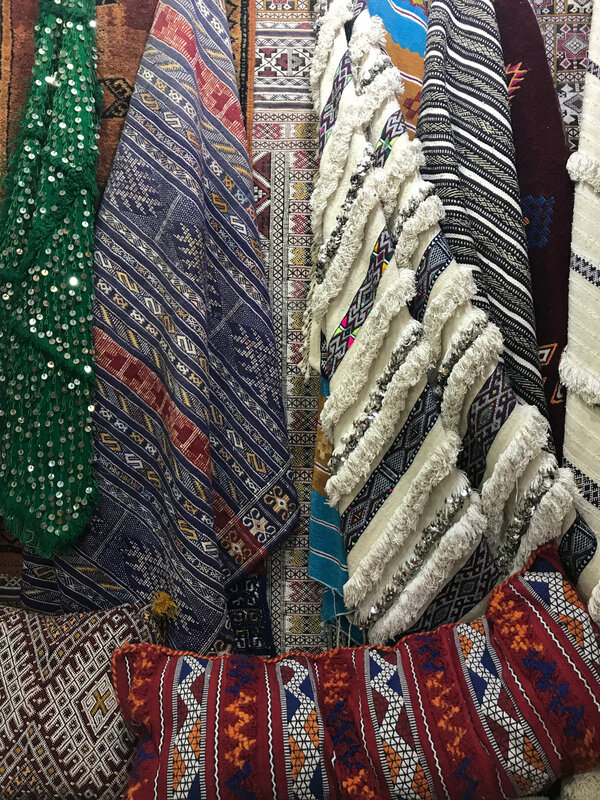 Like pom pom blankets, pillow covers, rugs and caftans! 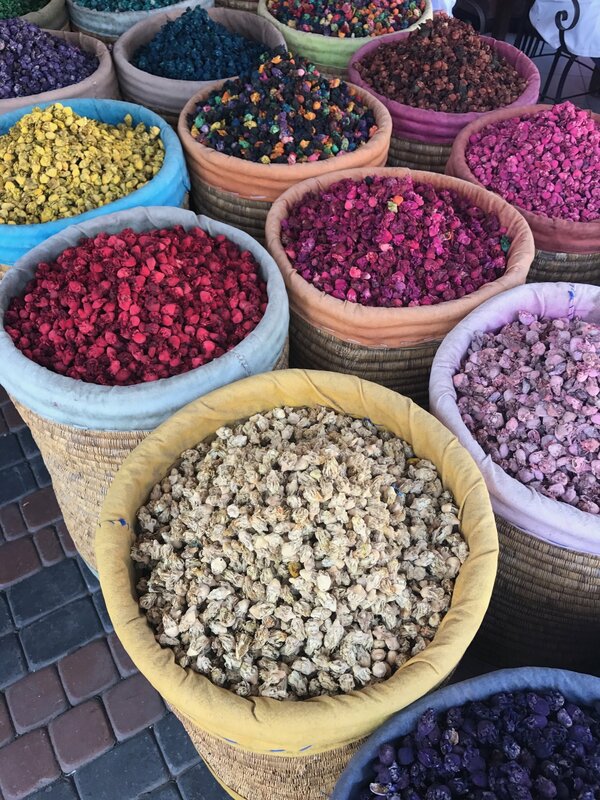 One of my favorite areas to explore was the Place des Epices, or the spice market square. I bought perfume bricks for our Gum Tree team in amber, rose and cedar, spicy harissa and Moroccan curry for my husband, indigo for a friend, and colorful little crochet covered pumice stones for the shops. 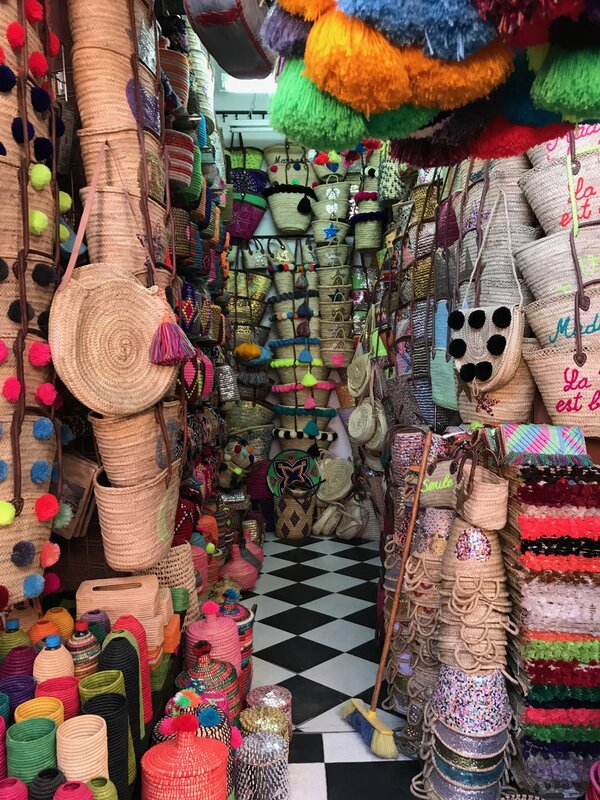 I could have bought a million baskets…but shipping can get expensive and since we’re going into winter I passed on most of them. Something to look forward to for my next trip! Another thing you’ll find a lot of are the kitties. 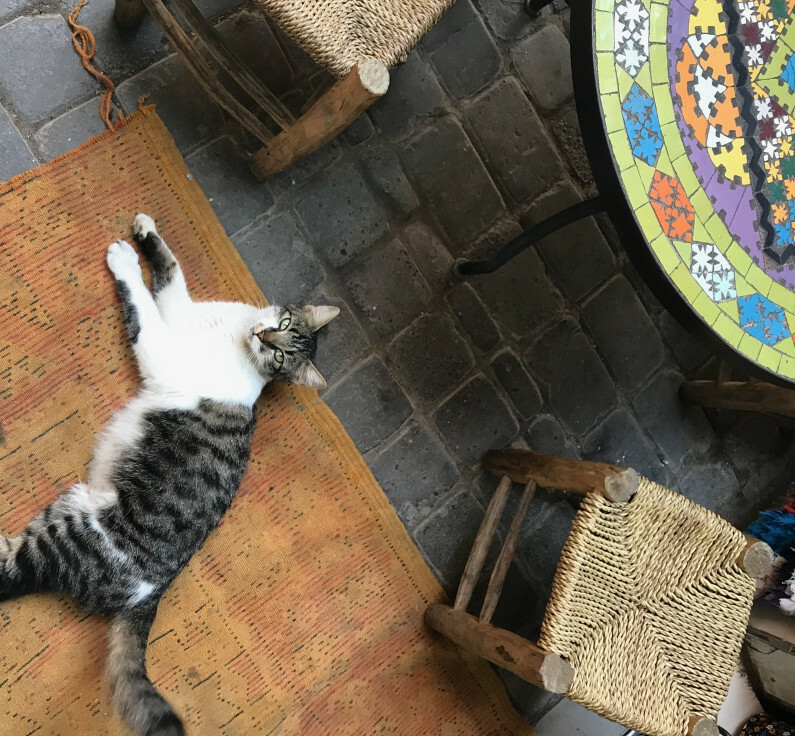 They are everywhere in the Medina, some are shop cats, but most are street cats getting by on what they can. I did see many of the merchants feeding them, and this little guy was super friendly and so beautiful. It’s a wonder I made it home without sneaking a couple of the kittens I saw in my bag. All that shopping and I haven’t even mentioned the rugs! Rug shopping is an experience in itself. 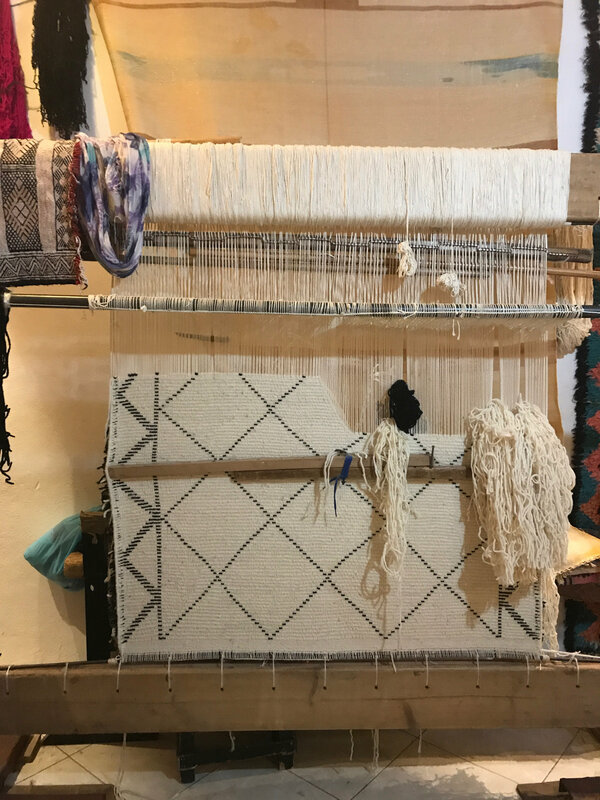 It’s time consuming, there’s mint tea, and many strong guys who pull giant heavy rugs out of pile upon pile so that you can find just the right thing. We hit the jackpot at this place, look how fancy! I’m crossing my fingers that all of my purchases for the shops arrive by the end of this week. 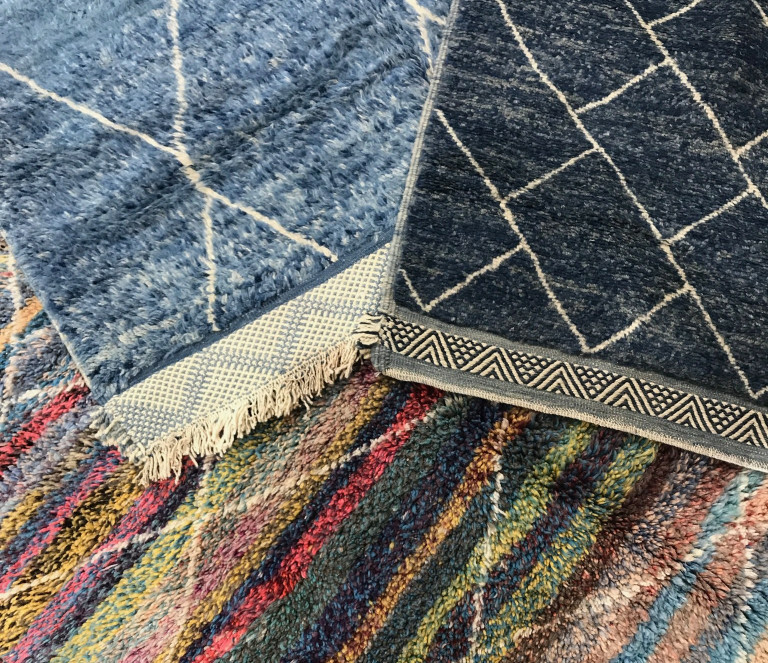 I was thrilled to find so many soft beautiful rugs in shades of blue, perfect for our beach lifestyle. Don’t worry, I picked up some of the classic black and white Beni Ourain style as well, they already arrived and are at Gum Tree Hermosa! Talk about haggling, this takes patience, time and energy. We must have been here at least 2, probably 3 hours. And I went back again the last day for more. When you’re negotiating the price remember all those strong guys who helped to pull down the rugs for you will need to be tipped in cash at the end. 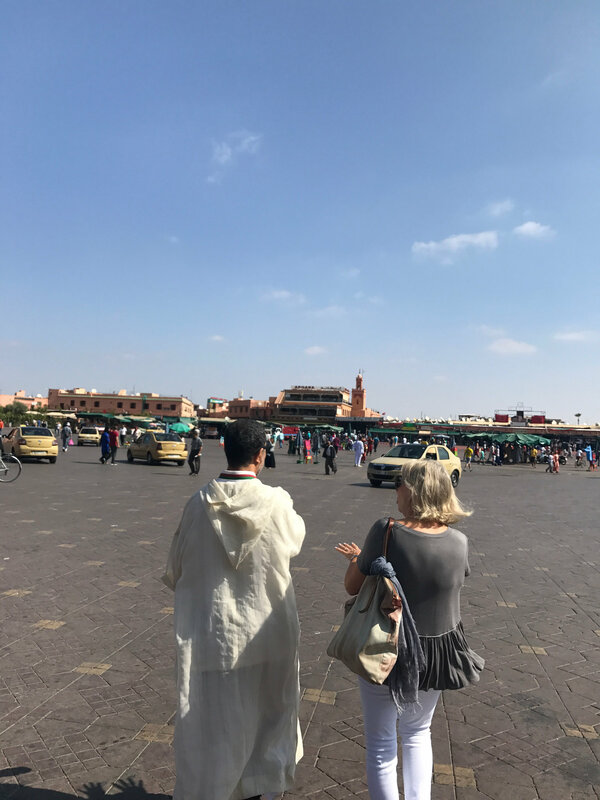 We hired a guide recommended by El Fenn, the fabulous Mustapha Chouquir, to take us into the ancient Medina on our first day. What a wonderful gentleman he was, warm, friendly and very knowledgeable. His website tagline is “your Marrakech GPS” and that’s the perfect description for him. 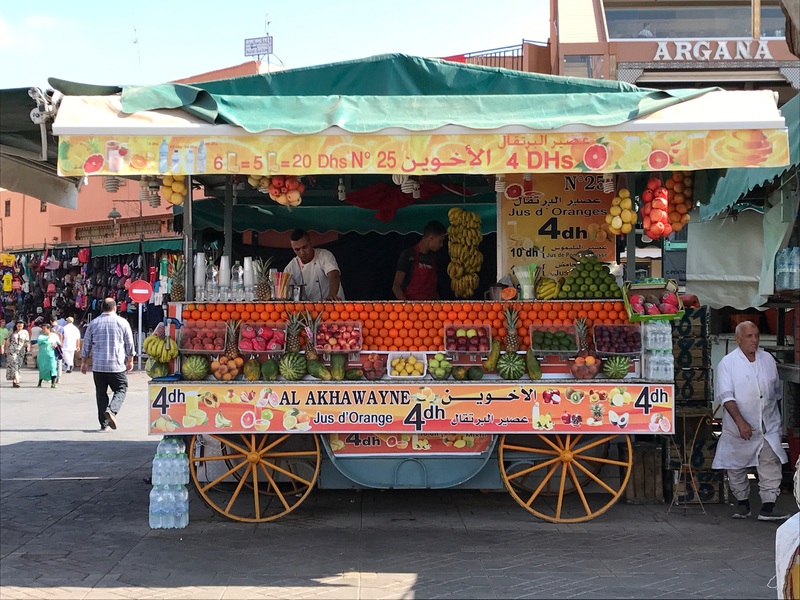 He took us through the famous Jemaa el Fnaa square past all of the carts selling fresh squeezed orange juice, snake charmers, food stalls, and then into the maze of the Souks. 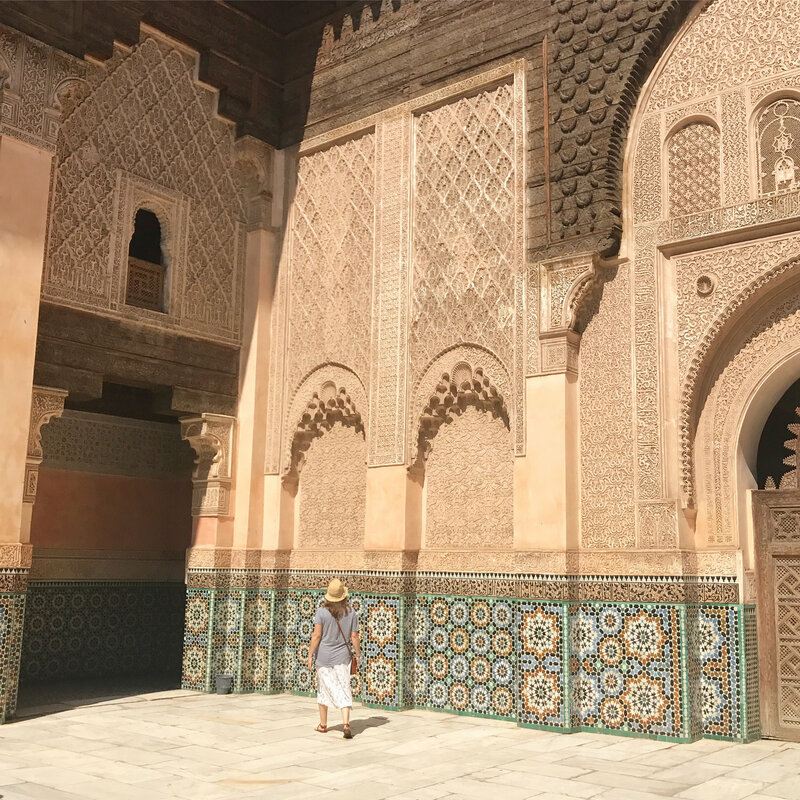 We headed first toward the Ben Youssef Madrasa, a religious college founded in the 14th century, the largest college in Morocco and a dazzling example of Moorish architecture. 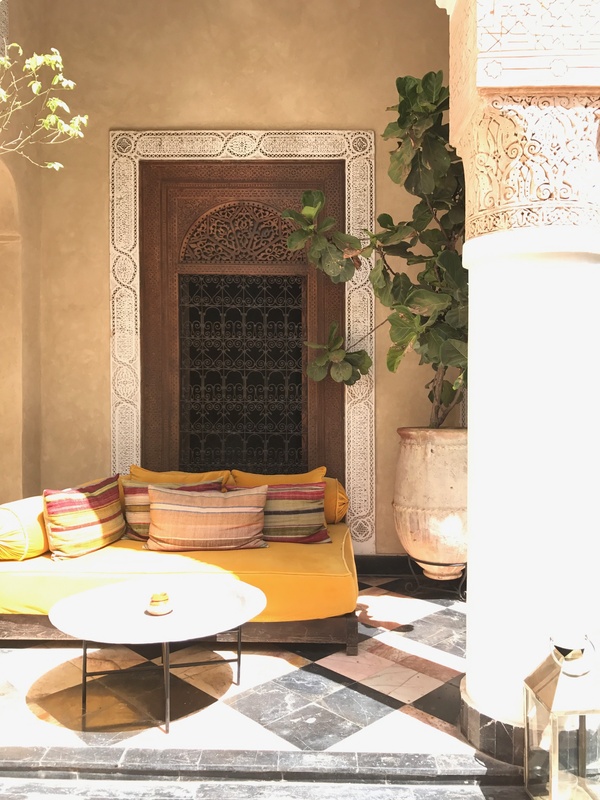 The courtyard is stunning, covered in the most beautiful zellige tile, with carved wooden doors and intricate plaster work, it’s a sight to behold. The college closed in 1960, underwent a major renovation and reopened to the public as a historical sight in 1982. 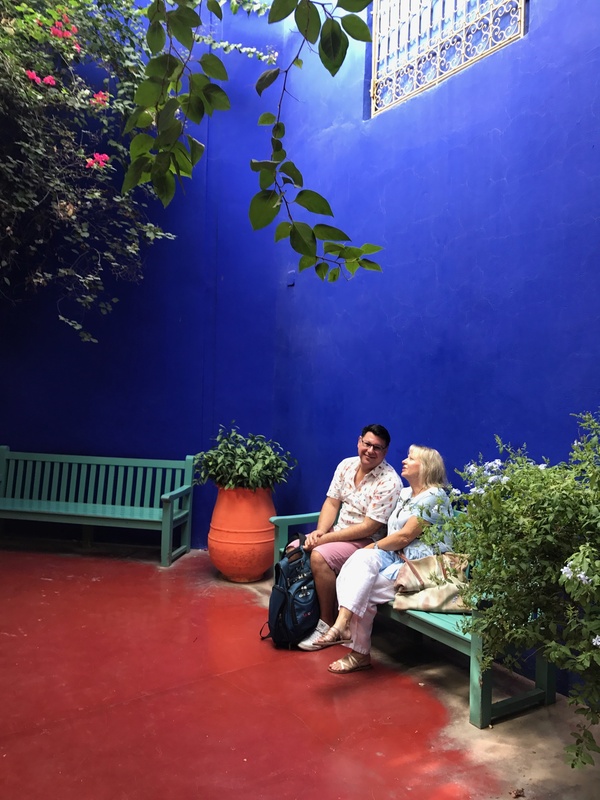 On another day we explored the beautiful Majorelle Gardens, Yves Saint Laurent brought these gardens back to life as a gift to the city he loved. 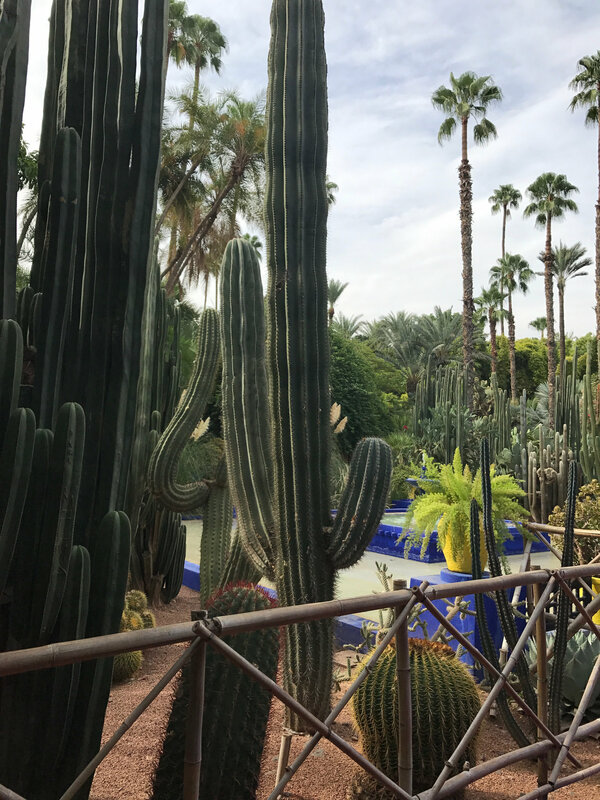 We wandered through the gardens, past all the cacti, palm trees, ponds, and fountains, and marveled at the unreal “Majorelle” blue color of the walls and walkways. If you go to the gardens, don’t miss the tiny Love Gallery, a room full of Saint Laurent Love Posters. Yves created one of these posters as a new year greeting every year from 1970 to 2000, and sent them to his best friends and clients. They are quite collectible now, I’m adding one to the list of things I might need for Christmas this year. Perhaps I’ll locate the year I was born? There is a cafe and a boutique as well here, and they were both lovely. We were advised that early morning was the best time to visit the gardens to avoid the tourist buses that descend on the place midday. 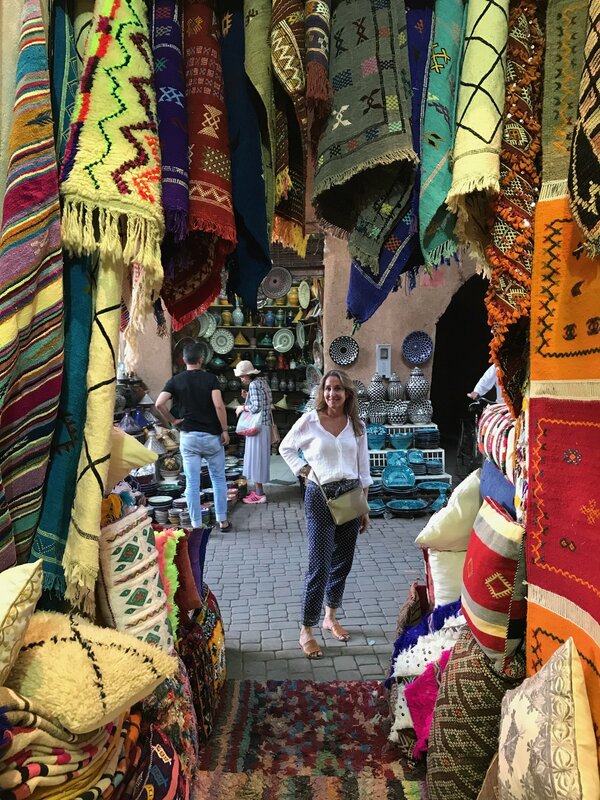 I spent a lot of time in the souks, the trip was a combo of business and pleasure for me, but others in our group took the opportunity to see a couple of other things. These are on my list for next time. 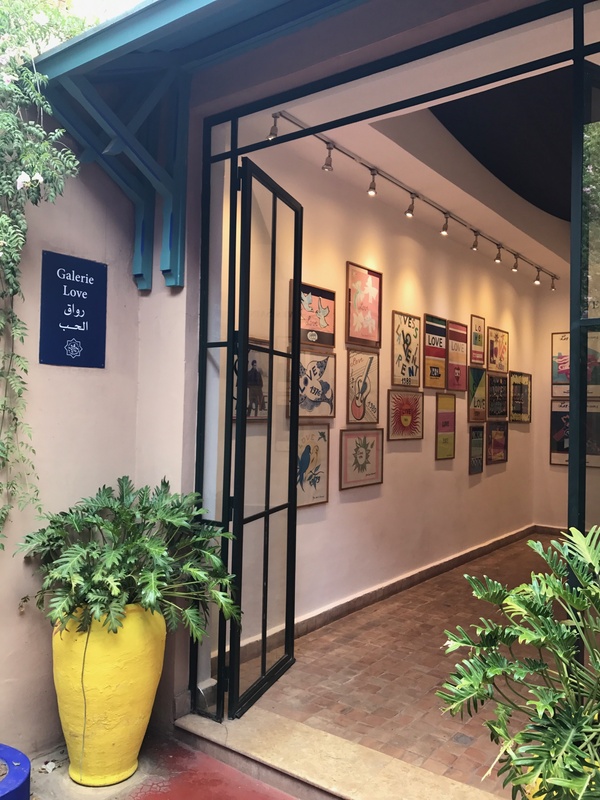 Maison de la Photographie…a collection of original photographs of Morocco in a Saadian townhouse. Rooftop cafe for lunch too. 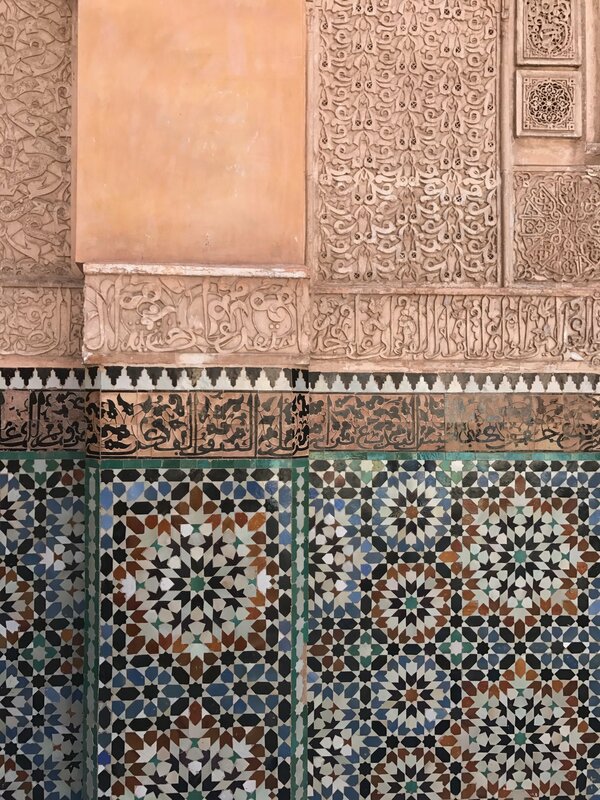 Bahia Palace…built in the 19th century on the edge of the Medina it showcases two centuries of Moroccan architecture and artisanship. In my instagram research I had probably seen hundreds of photographs of very glamorous looking people enjoying themselves at Scarabeo Camp. 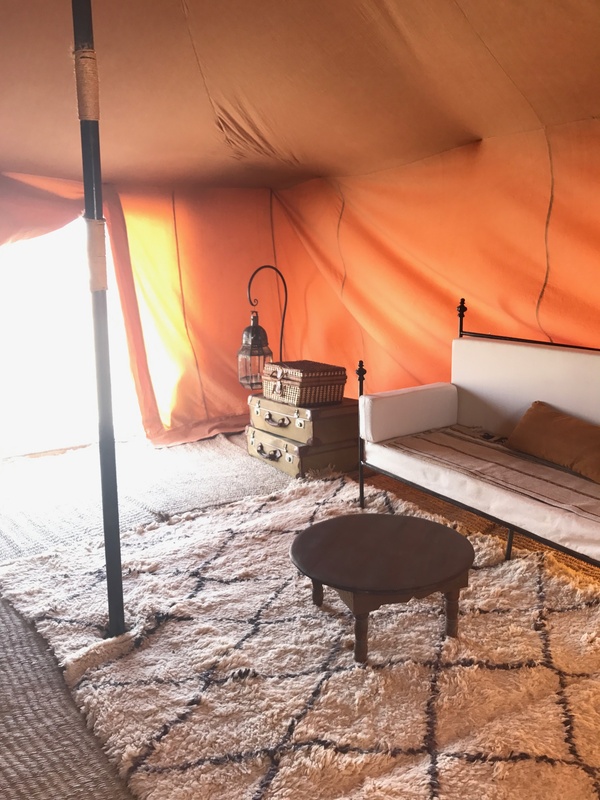 Scarabeo is a glamping site in the nearby Stone Desert, just 45 minutes outside Marrakech, so we wanted to give it a try for a night. It was beautiful, no doubt, but also very very hot. “Duh” you might say, it’s the desert, but seriously, we arrived about 3:00 on the hottest day of our trip at 105 degrees. Inside the tents had to have been at least 20 degrees hotter. It was beautiful, and stark, and did I mention hot? Once the sun went down everything took a turn for the better, the dinner was absolutely delicious, and I’m not sure I’ve ever seen more stars in my life than I did that night. I’m talking the whole milky way on display, it was really lovely. 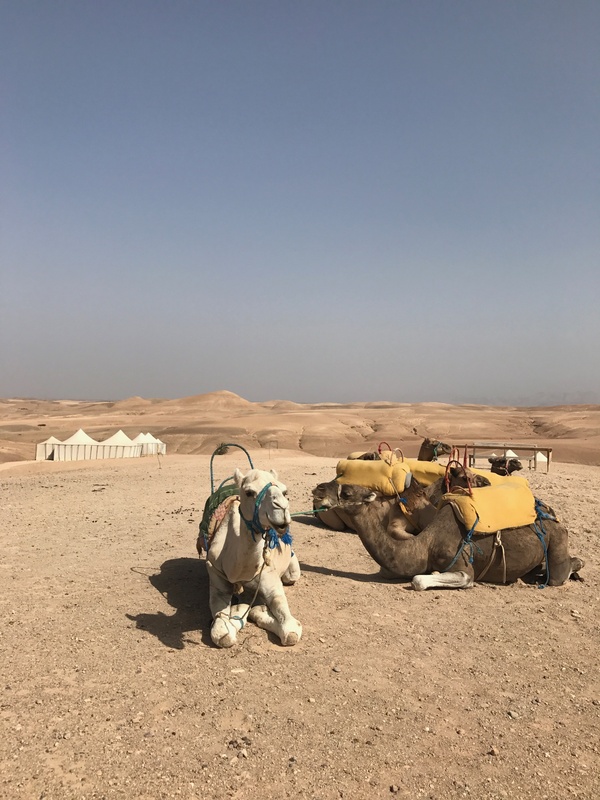 The camels were darling, and I wish I could say that we rode them, but to be honest while the sun was up we literally sat in the tent trying to not be overcome by heat stroke, with nothing but hot mint tea until the truck with wine and ice arrived near dinner time! It was an experience, and I’m glad we had it, but I’m not going to lie to you, we high tailed it back to our El Fenn oasis first thing in the morning, it was already 100 degrees at 9am. I would do it again if it was cooler than 85 degrees, or as a trip out for sunset, dinner, stargazing, and then the quick drive back to town. My husband and children are going to make fun of me forever for admitting to being such a princess, but they weren’t there to read the pamphlet about the bugs that can make a home in your luggage or shoes, or to pump the tiny camp toilet. I guess I’m just not cut out for this special kind of adventure. Back to civilization…and a trip to the spa! 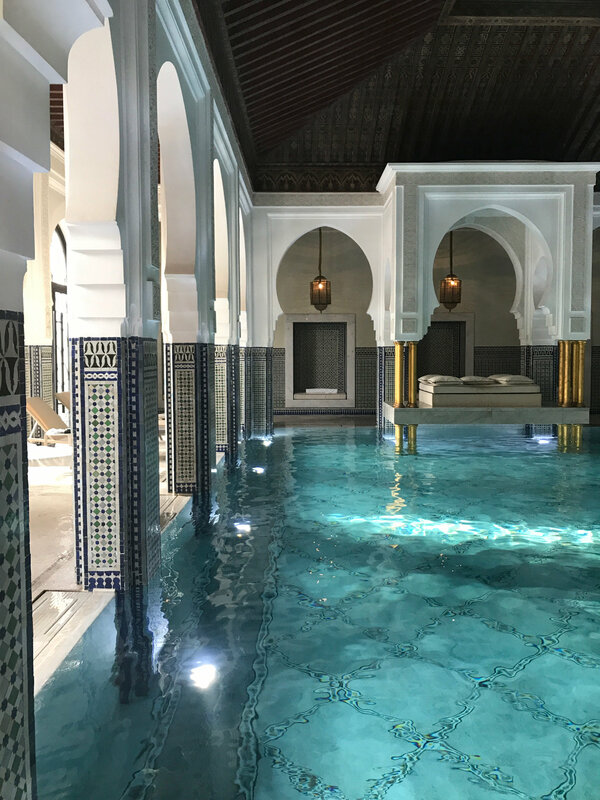 We decided on the Spa at La Mamounia for the traditional Hammam treatment followed by a massage. 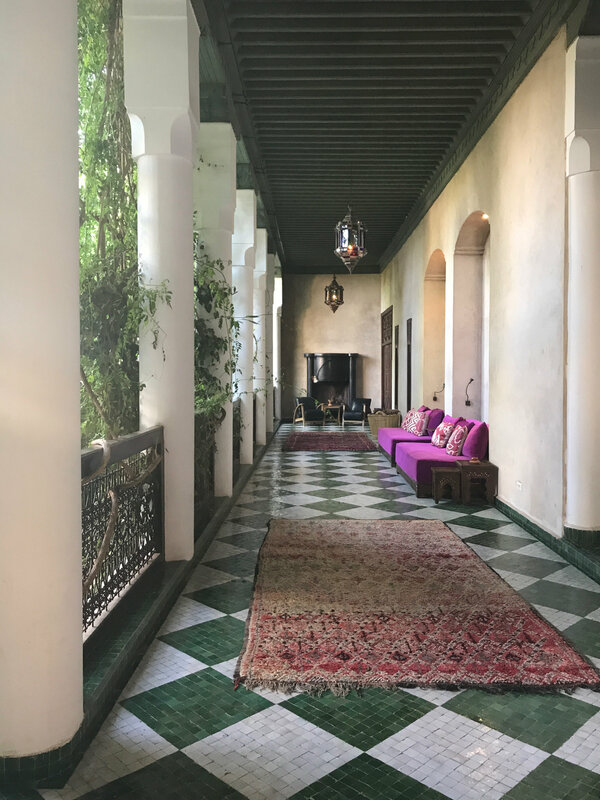 La Mamounia is a former palace turned hotel, set among acres of beautiful gardens just outside the old city. It is one of the great hotels of the world, and absolutely spectacular in every direction you look. Ahh, the Hammam treatment, an application of black soap, followed by a vigorous scrub with a loofah glove, a eucalyptus body mask, a shower under the loveliest rain shower head, then a massage with orange flower oil. It was a dreamy experience in one of the most beautiful settings I’ve ever seen. We stayed and sipped rose at the pool’s edge after our treatments. I’ve heard high tea here is an incredible experience as well. 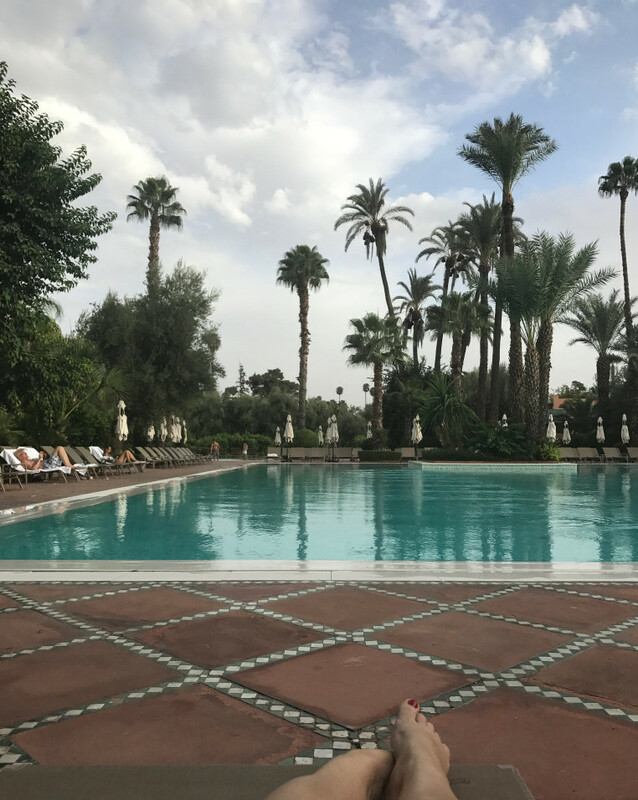 It was a magical place and when I get back to Marrakech I will make more time to get dressed up in my best caftan, explore the grounds, and have a proper cocktail in the fancy lobby bar while listening to the tuxedo clad musicians playing old time jazz standards. 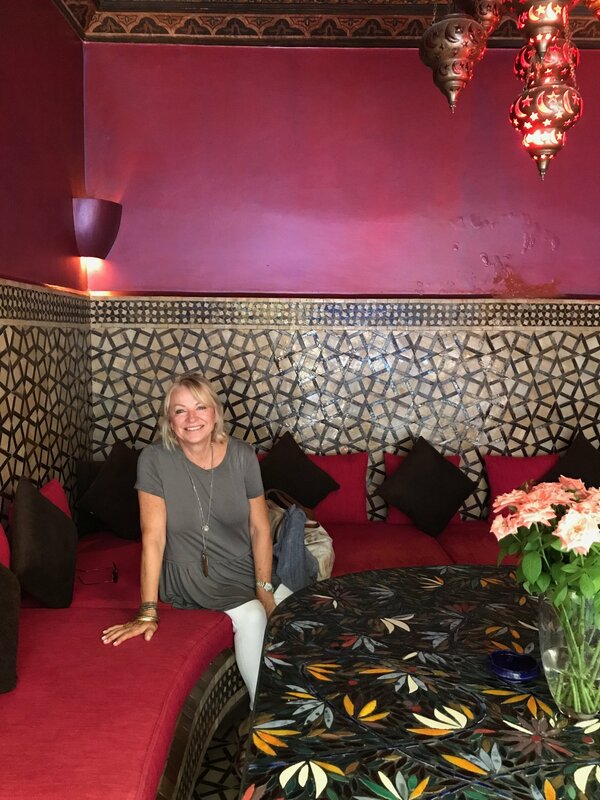 We had some fantastic meals on this trip, Moroccan food is delicious! Here were the places we loved. My beautiful mama in this incredible booth. This was our first lunch in the Medina, and it was delicious. 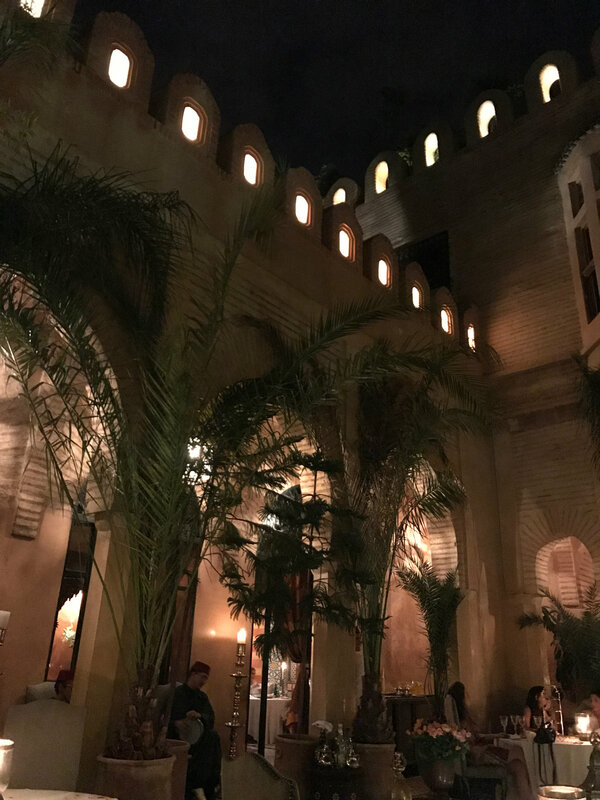 Cafe Arabe serves Moroccan and Italian dishes, but we all stuck to Moroccan. 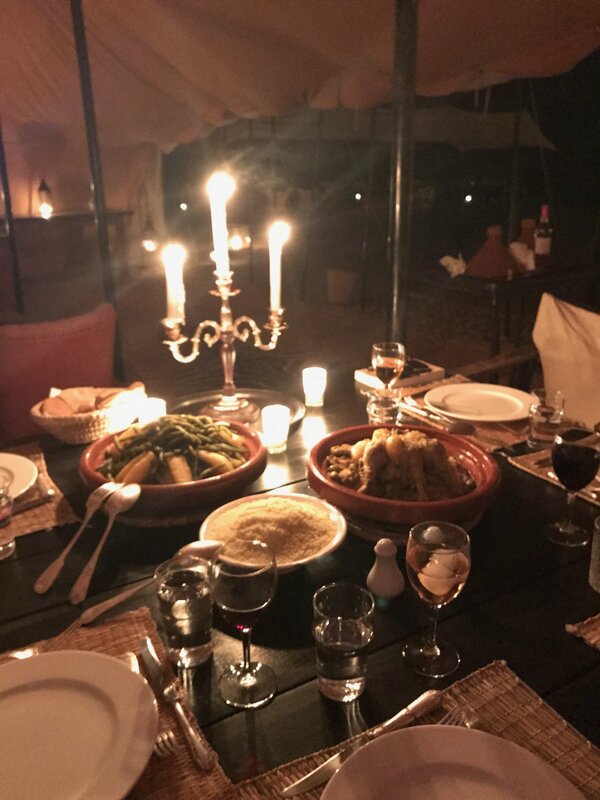 Couscous, chicken prepared in a tagine with lemon and olives, lamb with figs, a selection of the freshest salads, it was all great. The courtyard was beautiful and the service was lovely. 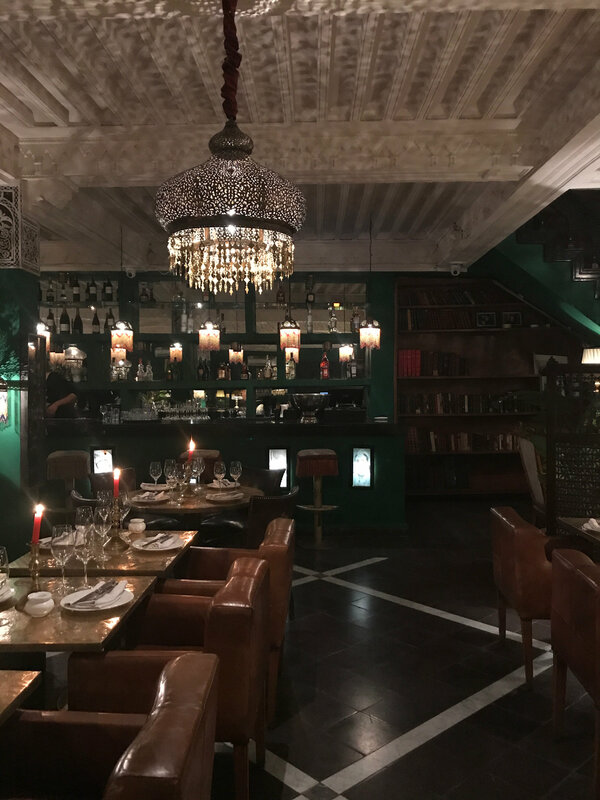 This is a modern Moroccan restaurant near the Place des Epices with 5 levels of dining rooms, we sat on the highest of the two roof decks. 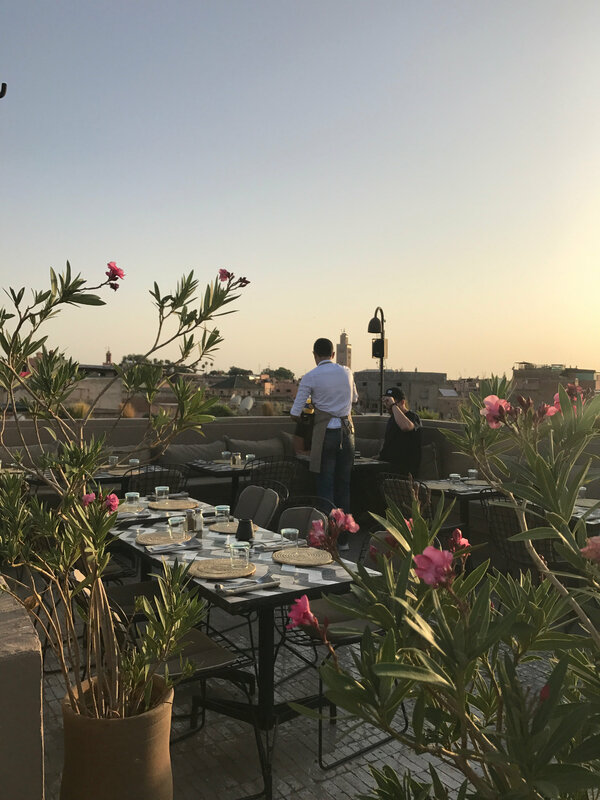 Make sure to book a table here for 7pm, that way you can be up there and see the light change over all of the red rooftops of Marrakech. And most importantly you can be there for the call to prayer just before sundown. It’s magic. 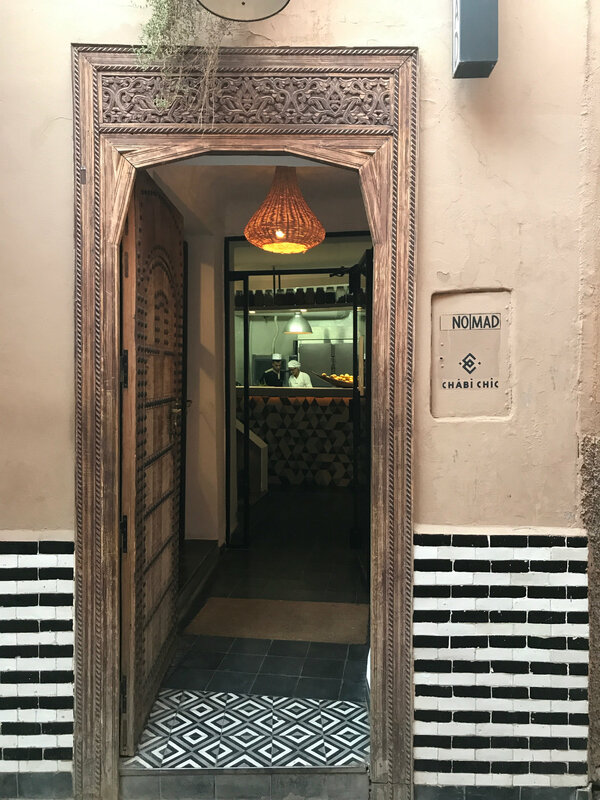 The food was delicious, the lentil salad with beets and goat cheese, the pastilla, a traditional filo pastry dish filled with chicken and herbs, and the spiced green beans come to mind. Just an FYI, there is no alcohol served at this restaurant. But there are delicious fresh juices and tart fresh squeezed mint lemonade. I’m sure this would make a wonderful stop for lunch as well. This was an experience I will never forget, and it started before we even got there. 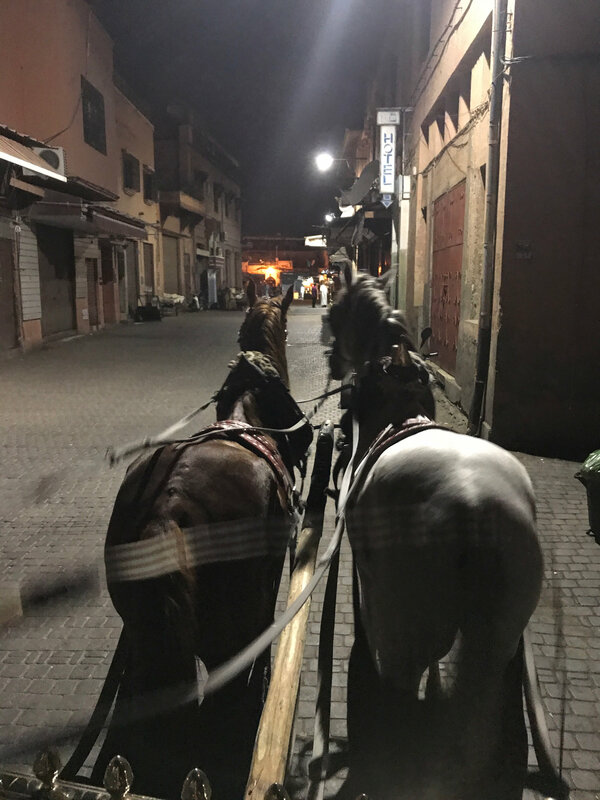 The restaurant sent a horse and carriage to collect us at the Riad, and we rode in style right through the bustling Jemaa el Fnaa square, past the thousands of people, groups of musicians, lantern sellers, snake charmers, and street food vendors. 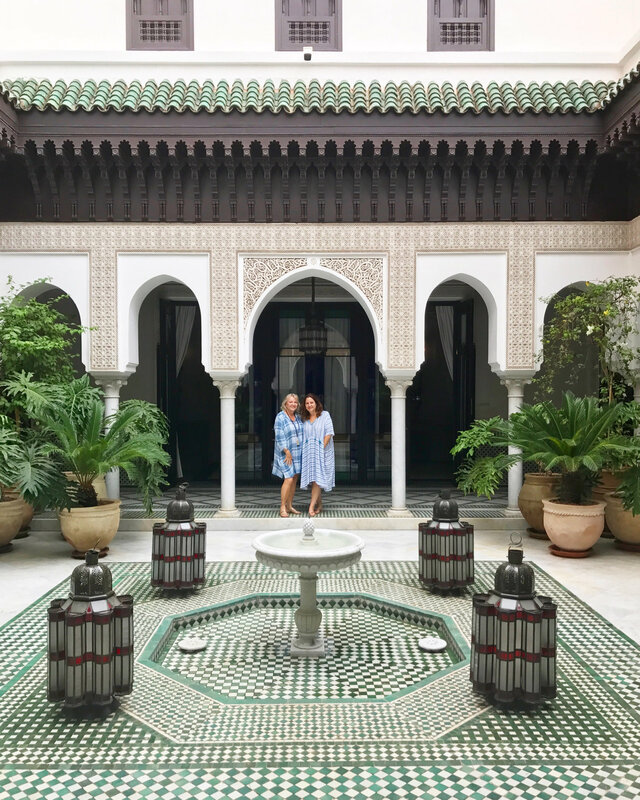 When we arrived we were ushered up 4 flight of stairs, past some of the most beautiful colonial style bars and dining rooms, to the glass enclosed roof deck. 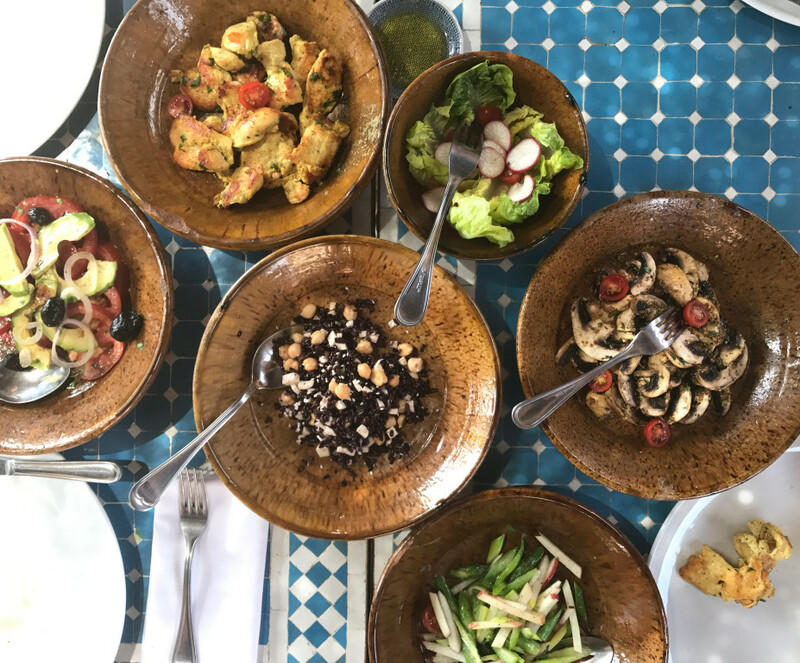 We all ordered the tasting menu, and were treated to the most incredible array of 15 different fresh salads, carrots done two ways, beets, tomatoes, eggplant and more. Then on to the pastillas stuffed with lamb, seafood, chicken and vegetables, followed by tagines and couscous galore. We drank a french red with dinner, and enjoyed every second of it. At the end we hopped back onto our horse and carriage and were whisked away home. Jemaa El Fnaa at midnight. Another incredible experience like no other. 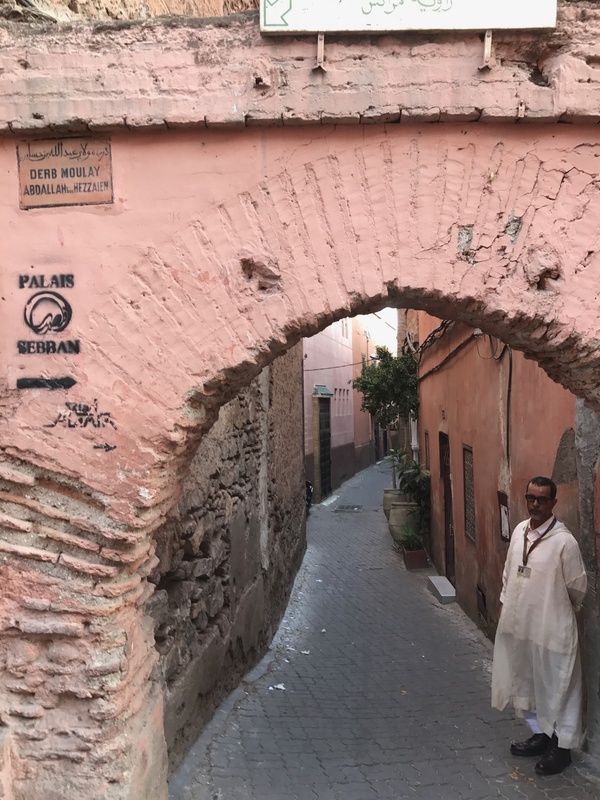 A taxi wove through the tiny streets of the medina and stopped in a non descript alley, where a very tall gentelman in a white robe greeted us and walked us through a little alley to a non descript door. 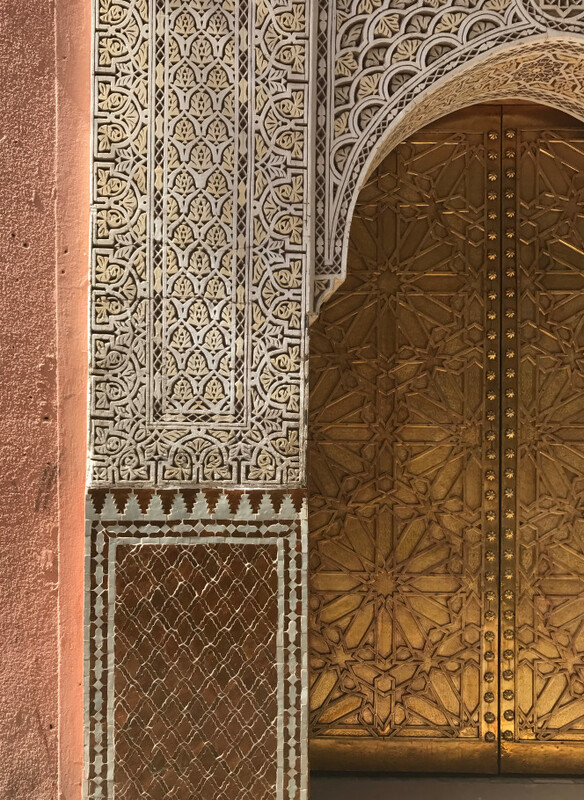 This is the thing about Marrakech, you never know what’s behind that plain old door! Inside the setting was absolutely beautiful. 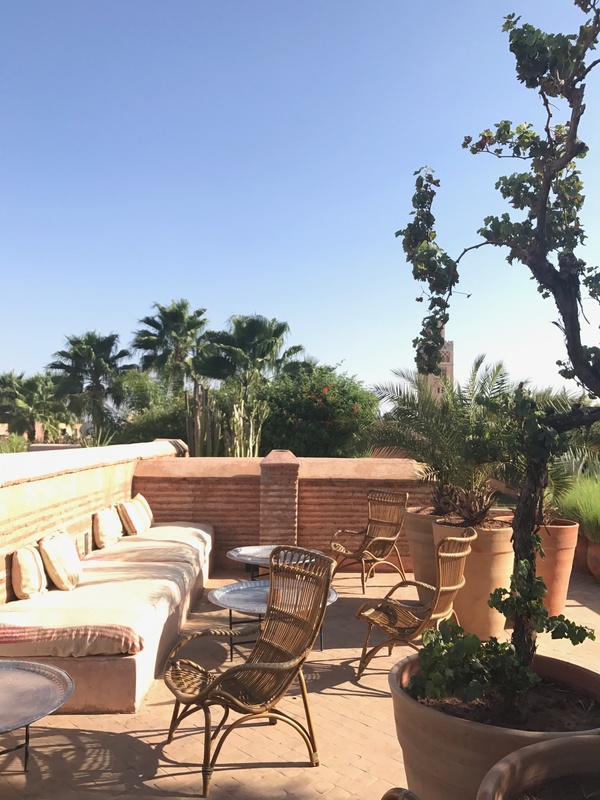 This time we were led up to the roof top terrace for a cocktail first and treated to a couple of musicians seated on the ground playing traditional music and spinning the tassels round and round on the tops of their Fez’s. 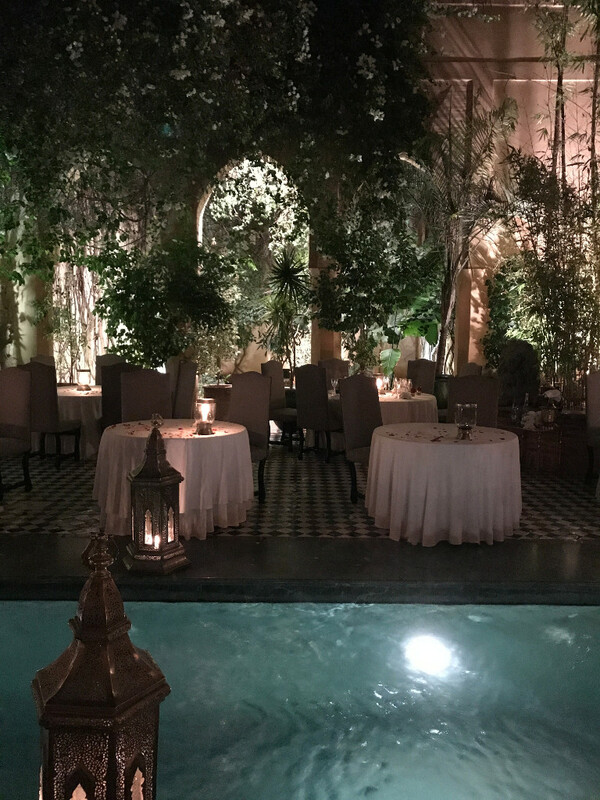 Then we were ushered back downstairs into a beautiful courtyard and seated next to a glowing fountain. In fact the whole place glowed with the most beautiful candlelight everywhere you looked. This is a set menu at a set price, with all wine included. The lovely local Rose was served out of the most incredible cut crystal, hand painted carafes. 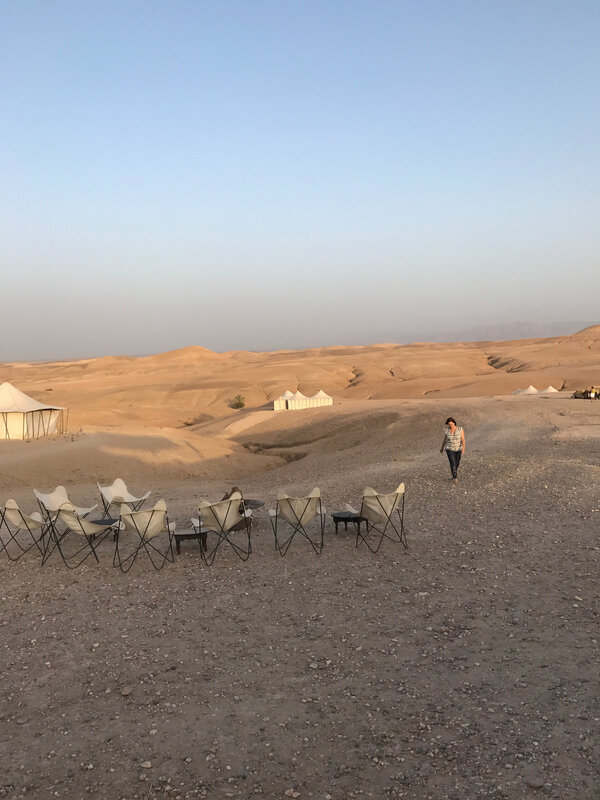 The service was friendly and attentive, and there was enough traditional Moroccan food in the 5 courses to feed an army. 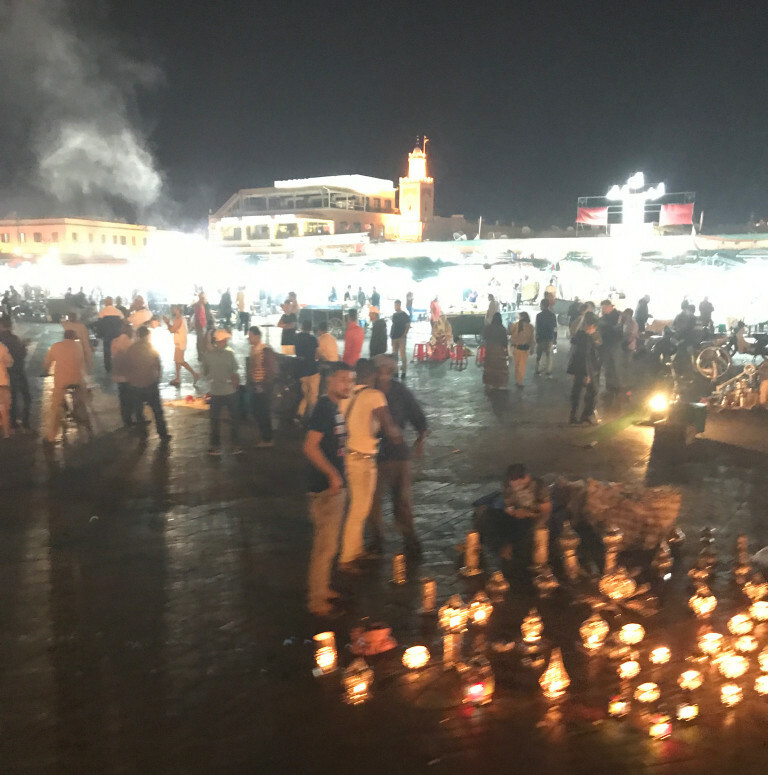 I would recommend this experience to anyone traveling to Marrakech, it was magic. And this is the food tour I was hoping to take. 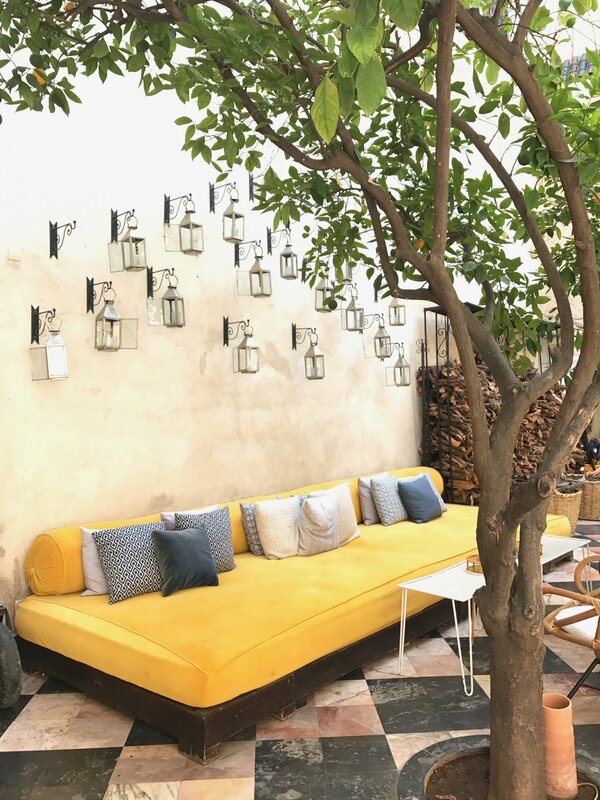 Nothing happens fast in Marrakech, so just slow down and enjoy the time you have here. 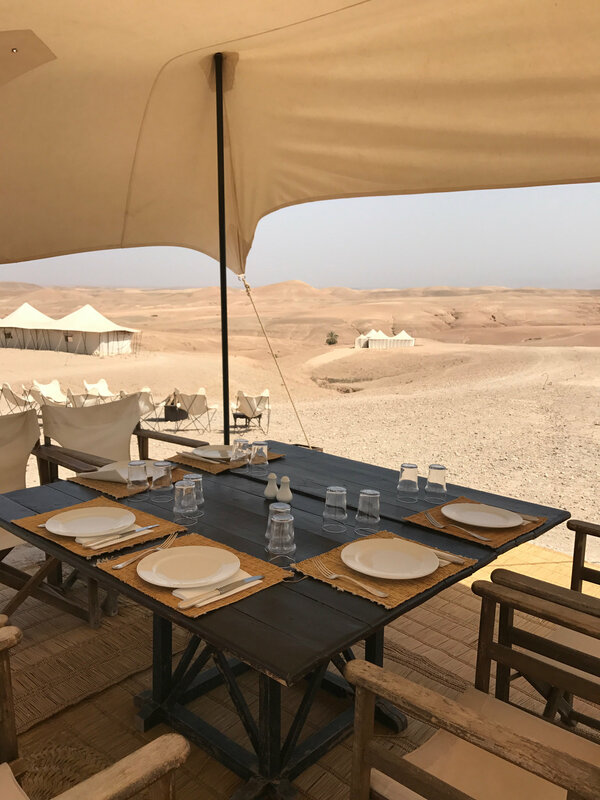 Internet is spotty at best, and there are no TV’s at El Fenn, so you’ll need to try to relax and enjoy a different pace of life. You are in a Muslim country, so ladies be respectful and dress appropriately. Cover your shoulders and your knees when you go out in the Medina. A loose fitting, longer caftan works every time. 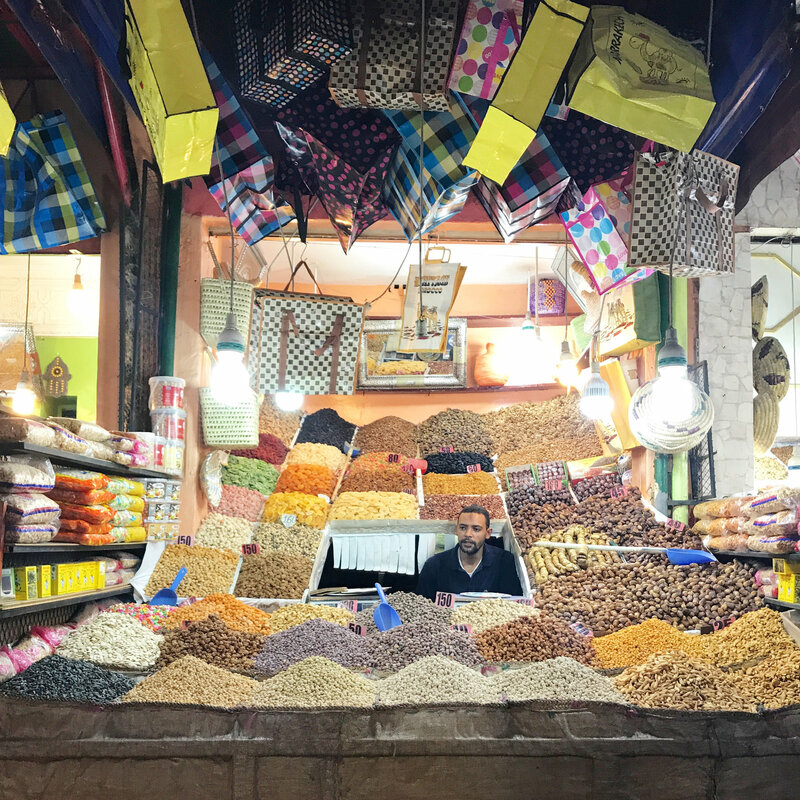 If you ask a stranger for directions in the souk be prepared to pay for the information. Better to pop into a restaurant or bank, or to ask one of the merchants you’ve already been buying from. Also good to keep the card for your Riad in your purse in case you need it to get back there. If you don’t like snakes then walk quickly through the Jemaa El Fnaa. Hiring a guide for our first day was essential. 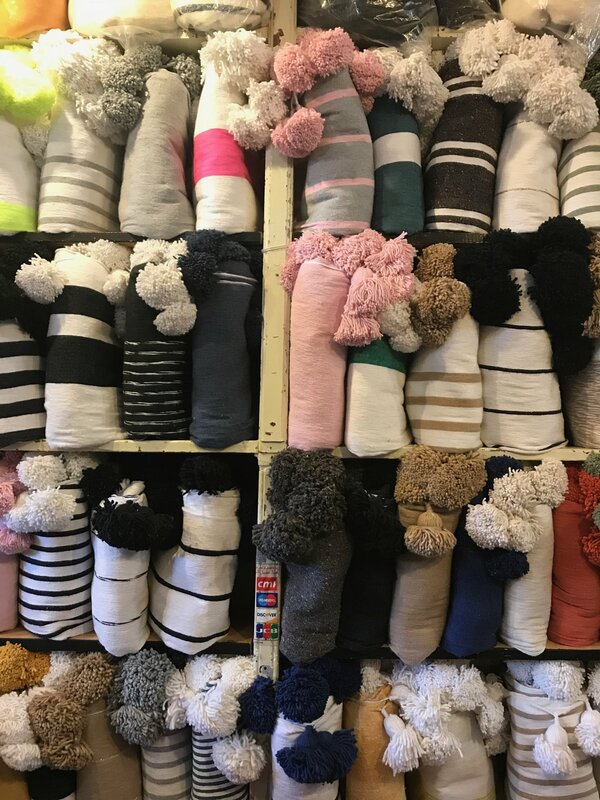 This way you’ll get your bearings, no one will bother you, you’ll see some sights and learn some history…and when you purchase 12 heavy pom pom blankets and don’t want to carry them, your guide will insure that they are safely delivered to your hotel. 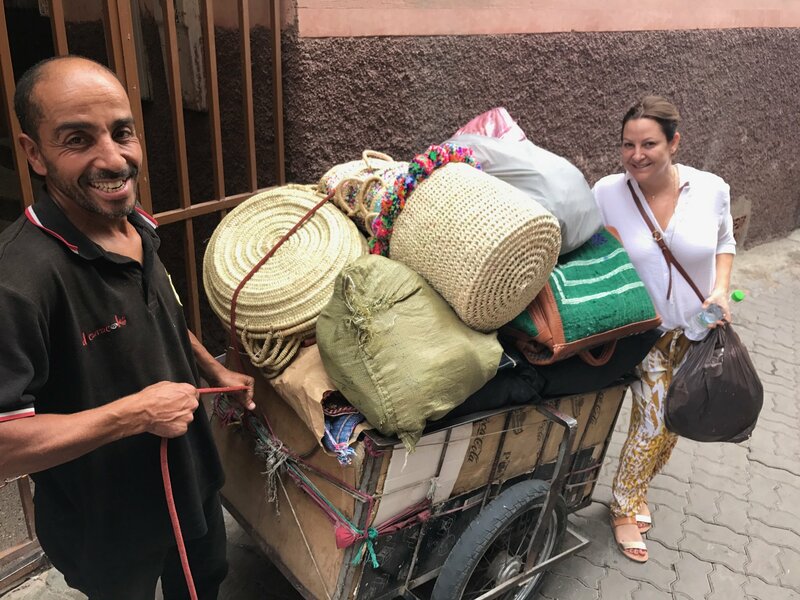 Best to hire Mustapha, literally everyone we passed knew him, and he promised me that if the dozens of rugs I purchased didn’t make it to the USA that he would come deliver them himself, and I believe he would. Thank you Mustapha for your time, guidance and generosity. A note about the food on this trip…It was fantastic, but how can I say this delicately? Our tummies may not have been quite prepared for the difference. Some of us had it worse that others, but we all had issues to some degree. All I can say is thank goodness for those that were smart enough to bring the Immodium. Probably best to stick to bottled water too. 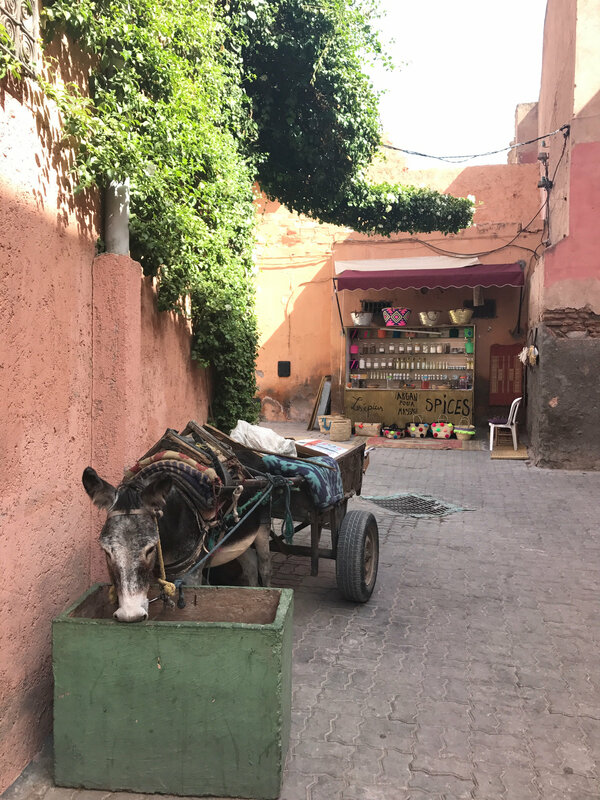 I could go on and on here, this trip was one of the best I’ve ever taken, and magical Marrakech is definitely on the top 3 of the “favorite places I’ve ever been” list. I’d like to thank my fantastic traveling partners, Ed, Mom, Reuben, Nicole, and BJ, you made everything even better, what a stellar group. Wish I had even one photo where we’re all in focus, how did I end up without one! Did I mention that we stopped in Lisbon, Portugal for 2 1/2 days on our way home? That’s another post in itself, coming soon. This entry was posted in Gum Tree Travels by Lori.